an Eastern North Carolina Tradition! 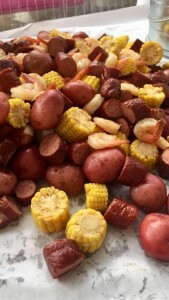 Jumbo Shrimp, NC Smoked Sausage, Red Potatoes, Corn on the Cob and Old Bay boiled in one big pot and, like tradition, dumped on the table for your guests to gather around and enjoy! Copyright © 2017 A Thyme Savor. All rights reserved.